Welcome to St. Anthony's Bed and Breakfast in the heart of Doolin! 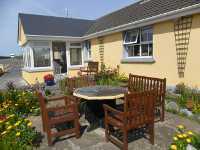 St. Anthony's Bed and Breakfast is a perfect location for visiting the Cliffs of Moher, the Burren and the Aran Islands. From the house it is just 10-minutes walk to Doolin Pier for boat trips to the Aran Islands, 10-minutes drive to the Cliffs of Moher, which can also be reached on foot (1½ hours walk) and 15-minutes drive to the wonderland of the Burren, a walker's paradise. 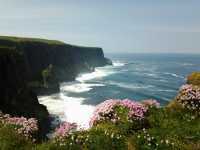 Our house is an ideal base for scenic walks along the Doolin coast. From Doolin Pier you can enjoy beautiful sunsets and a view of the Aran Islands. The beautiful sandy beaches of Lahinch and Fanore are just 15-minutes drive away. Those who are into golf will enjoy the Pitch and Putt in Doolin (2-minutes walk from the Bed and Breakfast), which offers spectacular views of the Cliffs of Moher. Horse riding facilities are also nearby. 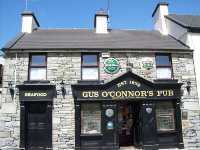 And, last but not least, as we are located "between the Guinness, the music and the sea," the famous O'Connor's Pub is just a few doors from our Bed and Breakfast. © 2014 St. Anthony's Bed and Breakfast. Site created by North Clare Computer Repair.